The observance and celebration of feasts and festivals constitute the joyous aspect of the religious life of the people. According to the Shalivahana (Saka) era followed in Goa, the New Year of the Hindus is heralded by the 'Sonvsar Padvo' (Samvastsara Padva) meaning Chaitra Shudh Pratipada. The day begins with a flag-pole being installed in front of the house and munching of leaves of bitter lime, sweet eatables being prepared for mid-day. The most important and almost the national festival for Goan's is the Ganesh Chaturthi known as 'Chovoth'. The festivities run into several days, at least two and half days, when puja of Gouri and Mahadev along with Ganapati, is performed, Gouri being drawn on paper and Mahadev on a coconut. On these days married women fast. On the Chovoth day, in the morning or evening, a clay idol of Ganapati is brought home. Before that a matov (pavilion or pandal) is prepared with bunches of betel nut, coconut, bananas and branches of mango-trees being necessary ingredients of it. 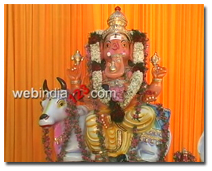 The puja of Ganapati goes on until mid-day. The puja is performed with the help of the priest. On the second day, in the evening or at night, after performing the uttara puja of the image of Ganapati, it is taken in procession and immersed into the sea, creek, river, lake or well. Before the idol is removed from its stand for immersion, it is besought for the welfare of the household and its members. Three days of Chovoth means, days of great rejoicing for children. Girls collect different types and shapes of leaves for Gauri, Mahadev and Ganapati. There is competition in flower-making also. At least five vegetables are cooked on that day. Aartis is a special performance on the occasion of the Ganapati festival. On Panchami (fifth) day, in the evening, crowds of people move around the village to have a look at Ganapati. Women of the masses, dance and sing the Fugdi before Ganapati. Some houses keep Ganapati for five, seven or nine days and rarely up to Anant Chaturdashi.